The Daily Grind A low speed grinder chops up paper, plastics and other debris that is in the sewage. The incoming wastewater (influent) passes through a grit chamber and screening device that traps plastics, fibers and sand. The removed debris is transported to a landfill. The Grit Chamber The incoming wastewater (influent) passes through a grit chamber and screening device that traps plastics, fibers and sand. The removed debris is transported to a landfill. Oxidation The influent travels to a system of oxidation ditches where the organic material is oxidized and ammonia is converted to nitrite and nitrate. Biological phosphorus removal occurs when microorganisms in the wastewater are starved of oxygen, causing them to release phosphorus. When oxygen is reintroduced into the water, the microorganisms take up more phosphorus than they released, this process is called luxury uptake. The organisms now contain the phosphorus that was dissolved in the water. They are stabilized and removed from the system to prevent further release. Making it Clear Two clarifiers slowly separate biological solids from wastewater. The sludge settles to the bottom of the clarifiers where it is removed for dewatering, and the water is pumped to sand filters and further processing. Sludge Dewatering By now the sludge is a highly processed, uniform earthy "soup" of microorganisms, called "biosolids." It is then separated from the water, forming an organic rich cake. Drying Out The biosolids are taken to drying beds where they are mixed with horse bedding from local stables. This compost becomes a highly prized soil amendment, available to the public free of charge. 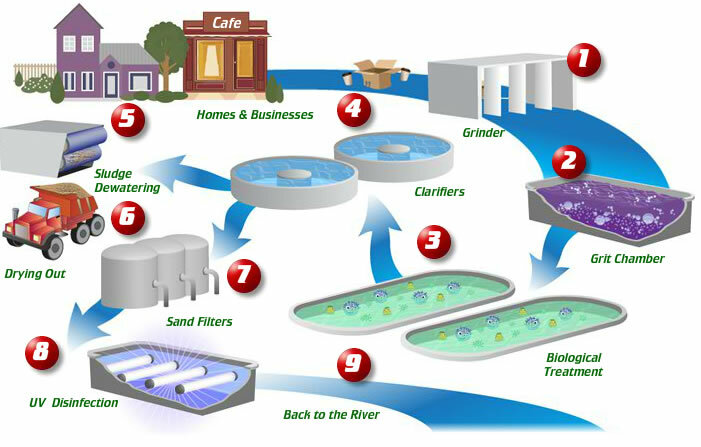 Filtering After the treated water leaves the clarifier, it is percolated through a sand filter. Disinfecting The water is then fully disinfected by exposing it to intense ultra-violet disinfection. A backup chemical disinfection system is on hand for high flow periods, particularly during the rainy season. Back to the River At the end of the treatment process the cleaned water is aerated and released to the Ventura River, completing the natural cycle and preserving the beneficial uses of the river.